The holidays are a busy busy time for most people. If you're in the mood to have a party, make sure that it's an affair your friends and family will want to pencil into their calendars. Because they know you have good taste in drinks, appetizers, dinner, decorations, and dessert! And that you throw a heck of a party. Tell your guests to come hungry and then set the mood with these festive bites. Cranberry baked brie brings out the colors and flavors of the season and is an absolutely delicious appetizer you should make. Not only is it easy (you only have to buy a wheel of brie and melt it in the oven), but it's also hot and will warm up your guests right away. 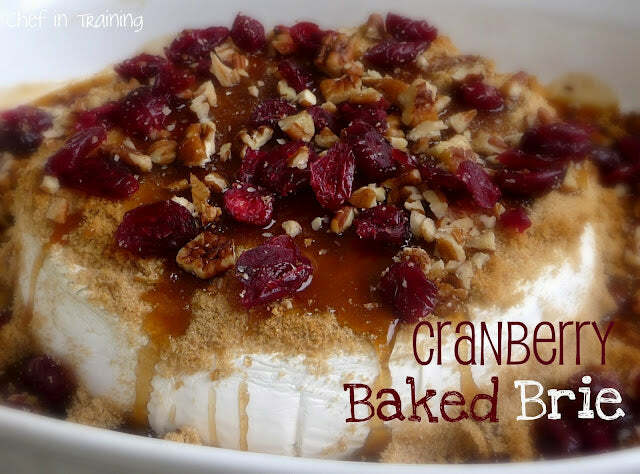 Sprinkle a wheel of brie with brown sugar and dried cranberries. Then, set out rosemary crackers, rye bread crisps, or even cinnamon Graham Crackers to complement the decadent, melty, and rich brie. Here's a tip: use pine bough clippings as a garnish to add an extra holiday element to this dish. 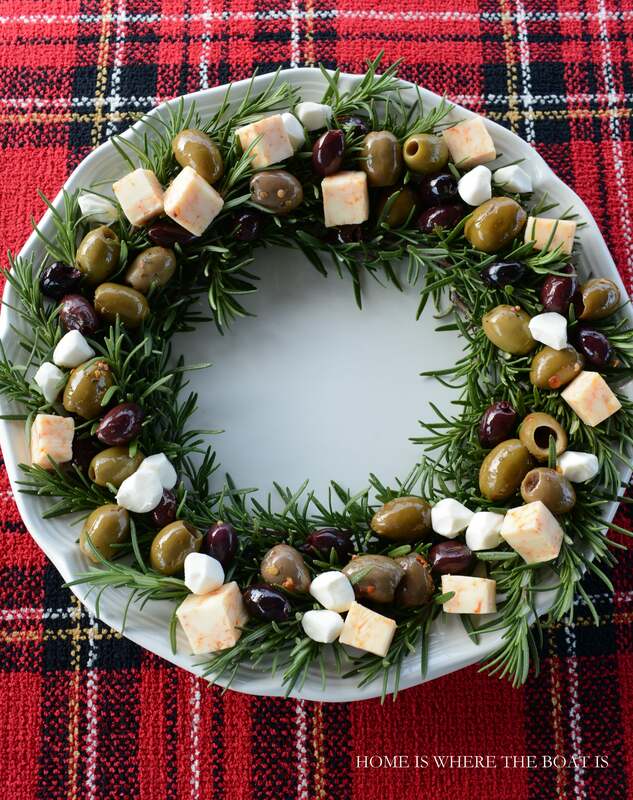 This gorgeous cheese and olive platter is set on a wreath of rosemary-so it looks incredibly Christmas appropriate and scrumptious! If you have a rosemary bush in your back yard, clip off some sprigs and line them up in a circular pattern on a dish (making sure you tuck in the blunt ends). Then, dot the top with cheese cubes and olives. Throw some candied nuts and figs on too for a variety of flavors, colors, and textures. 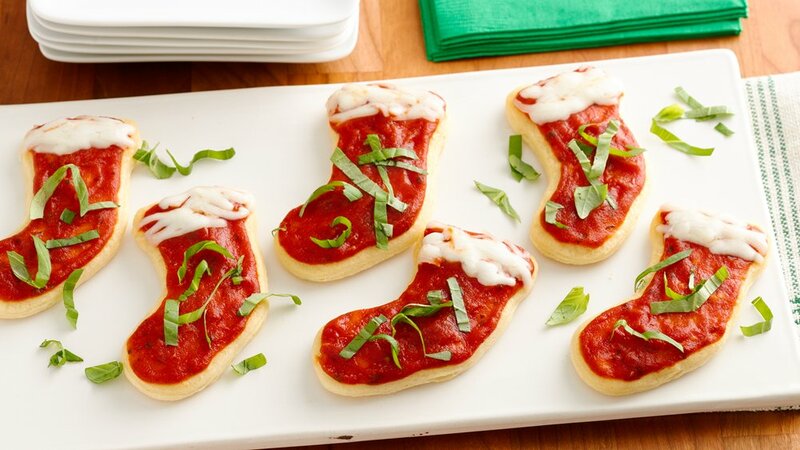 Use some puff pastry, tomato sauce, mozzarella cheese, and basil for these stocking-shaped pizza bites. Everyone loves a hot appetizer at a party and because yours will be thematic with Christmas, it will make it all the more special. Toast to yourself-the hostess with the mostest-this Christmas with these festive cocktails and drink ideas. Jell-O shots aren't the classiest, but these vodka-infused Christmas trees are. Make some Jell-O and let it set in a deep jelly roll pan. Once it's cooled and taken shape, use a tree cookie cutter to create these vodka Jell-O jigglers. Top them with shredded coconut for a faux snow effect or sprinkles for added spirit. 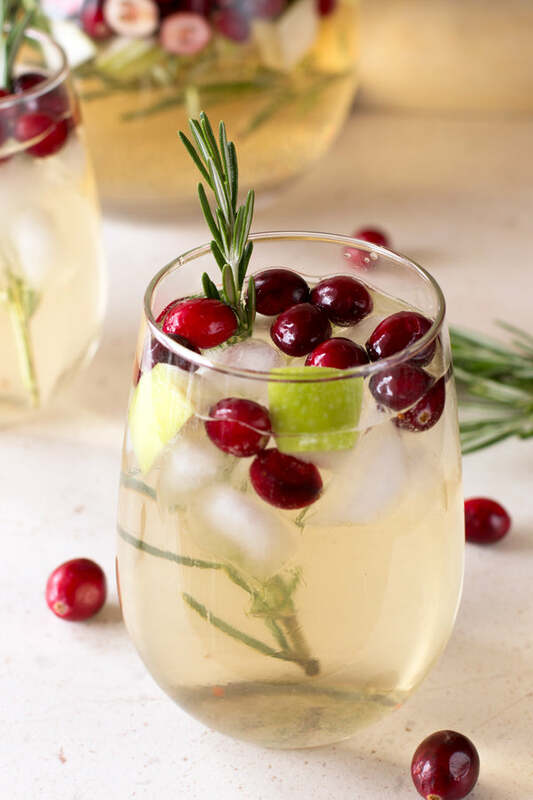 The cranberries and rosemary sprig in this sangria really set it apart from other summer varieties. Make a big pitcher or punch bowl with red or white wine and then get ready with garnishes for all of the guests who want to indulge in this sweet treat. 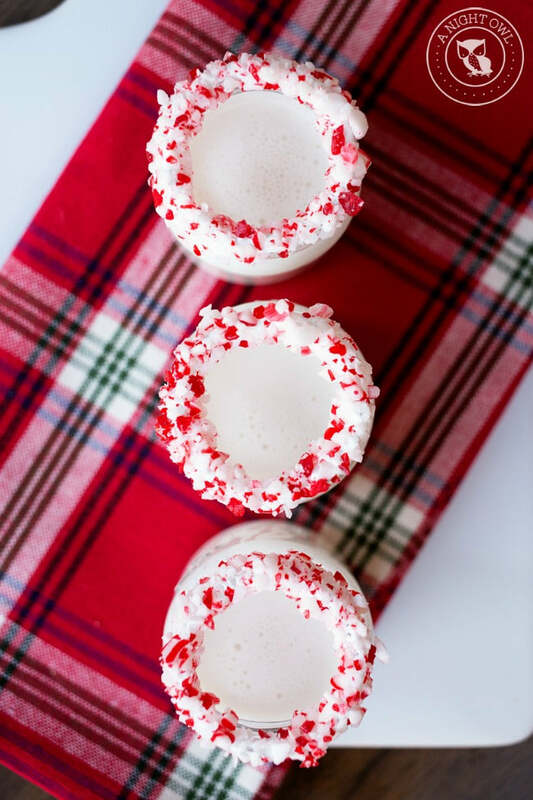 These are technically shooters, but we just love the idea of the peppermint rim. Crush up some peppermint candies or candy canes and get your glasses ready. You can try this recipe, or get even more holiday friendly by using virgin or alcoholic egg nog. There's another recipe with Peppermint Schnapps, Godiva liqueur, and more yumminess that also looks awesome and would go well with peppermint. Now that you have the appetizers and drinks down, make sure you have a line-up of fun activities to do while everyone is over celebrating the holidays. This game is a real hoot. Gather all of your party guests and break up into teams. Then, have everyone write Christmas-themed answers on pieces of paper (like Rudolf the Red Nosed Reindeer, Santa Clause, North Pole, The Grinch) and have the whole team act it out while one person tries to guess. It's hilarious and something everyone will love. Instead of secret Santa, try Secret Stocking. All you have to do is make a stocking, seal it shut, and have everyone write down what they think is inside. The guest with the closest guess wins whatever is in the stocking. We love this game because it can be silly or serious. 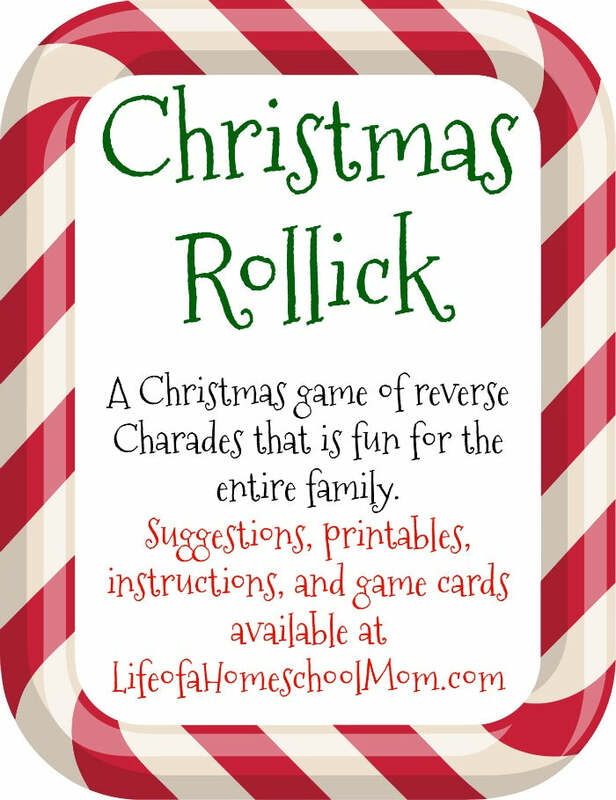 Plus, there are a ton of other great Christmas game ideas on the same link too. Deck your halls with holiday cheer-including some of these lovely ideas. 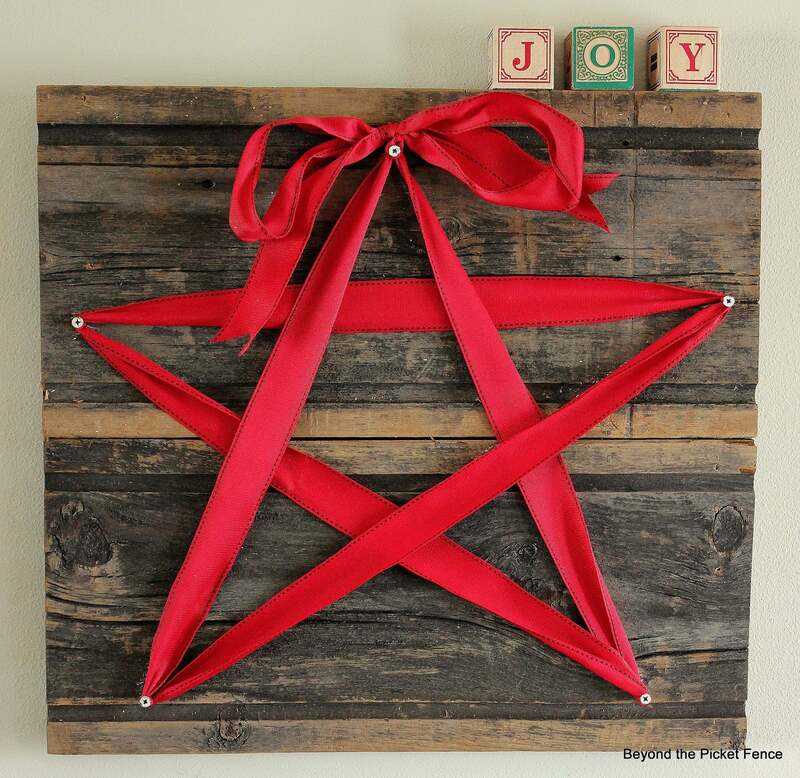 With old barn wood or pallets, you can make this jolly wall hanging. It's so simple, it shouldn't take you more than an hour to finish. Here's a tip: drill holes and string lights around the perimeter of the star for a holiday light fixture! Get your guests to the holiday dinner table with these stocking place settings. 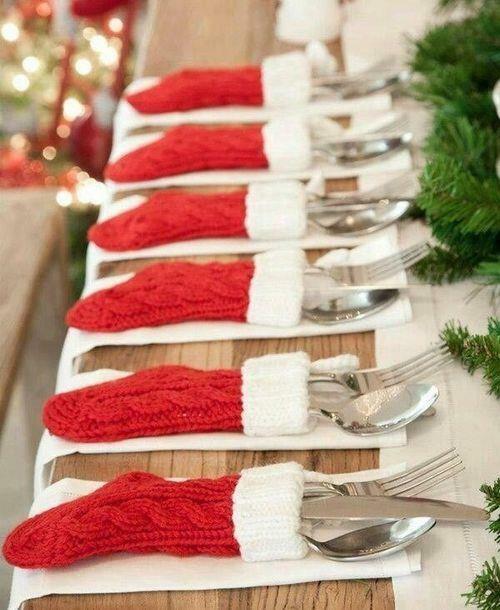 You should be able to find small stockings that will fit your silverware at the dollar store, so it's a cheap and quick way to add an extra design piece to your table. Go for traditional red for every seat or mix and match for a whimsical look. You don't have to go green and red for it to be a Christmas decoration. This winter-inspired mantel's whites and silvers set the tone of the holiday just as well. 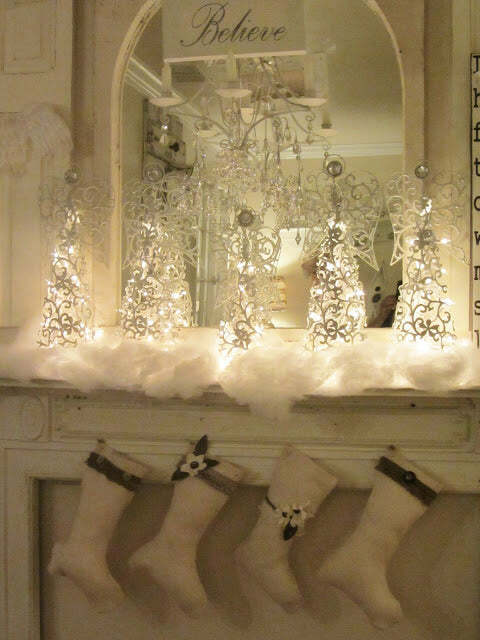 Use some cotton balls for faux snow, string clear lights around the top of your mantel, and then embellish it with beautiful stockings and metallic decorations. The main course of a Christmas feast is important! Make sure yours is mouthwatering by trying these recipes. Roast Beef is a popular cut of meat for Christmas meals. Even the Grinch carved a "roast beast!" However, this one is stuffed and a little more refined than a typical roast. 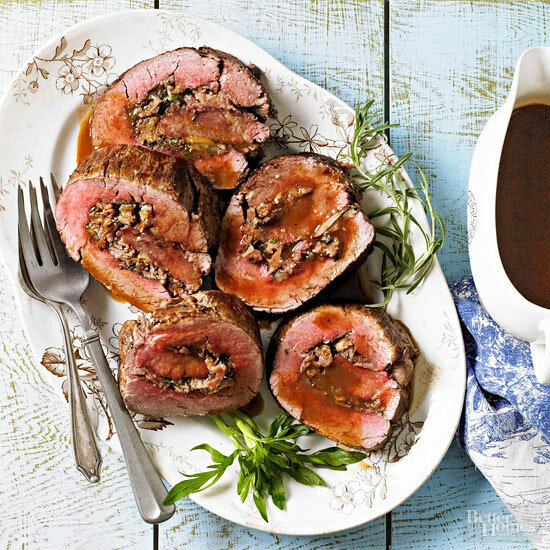 Paired with a rich gravy and fancy sides, you'll have a sophisticated meal that will impress your guests and fill their stomachs and hearts with glee. Freshen up your heavy meal with a winter salad. 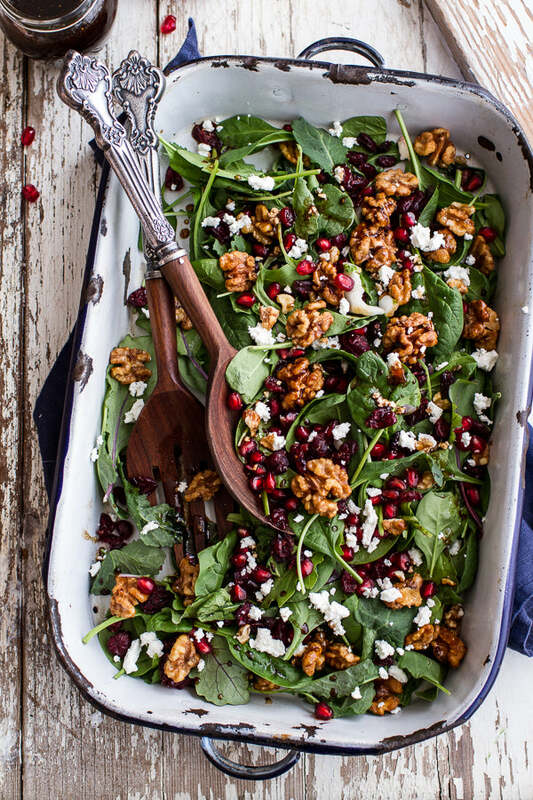 This particular one includes spinach, pomegranate, goat cheese, and walnuts, but you can customize yours with citrus or whatever you're in the mood for. Serve it in a big bowl family-style or portion it out in bowls at each place setting beforehand. One of the best parts of the holidays has to be the desserts. If you're tired of traditional cookies, give some of these sweets a run for their money. This may not be a fancy dessert, but it's presentation is! 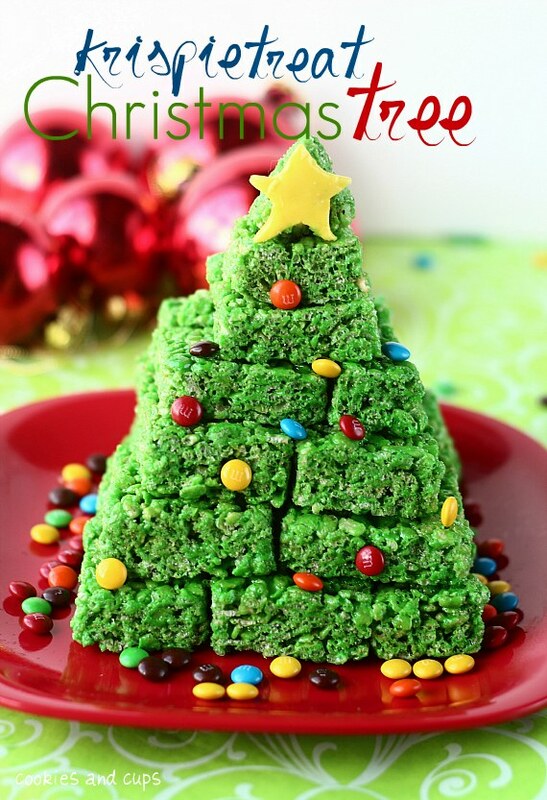 Make Rice Krispy treats as you normally would, but add green food coloring. Then, stack them in a Christmas tree shape and add some candies that look like ornaments. If you have kids upstairs who are hanging out during the party, this is a great treat for them as well as your guests. 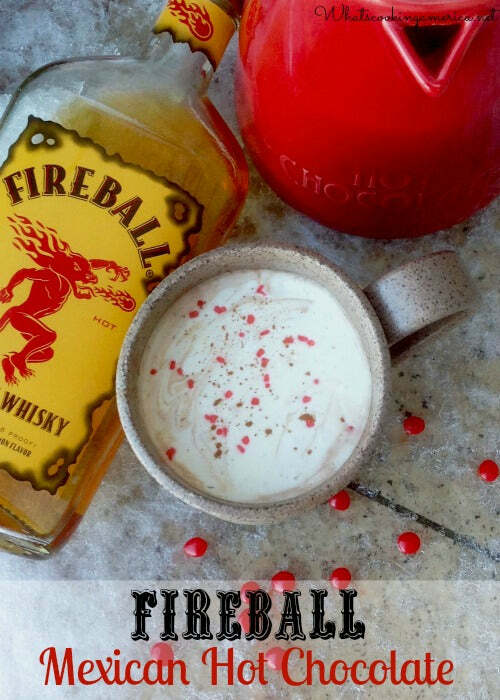 If you decide to go the liquid dessert route, try this spicy alcoholic hot chocolate! With cinnamon liquor and a spicy Mexican hot chocolate blend, your guests will be woken back up if they're groggy from all of the eating. Here's a tip: serve this hot chocolate in Christmas mugs or with a candy cane stirrer for even more holiday spirit. 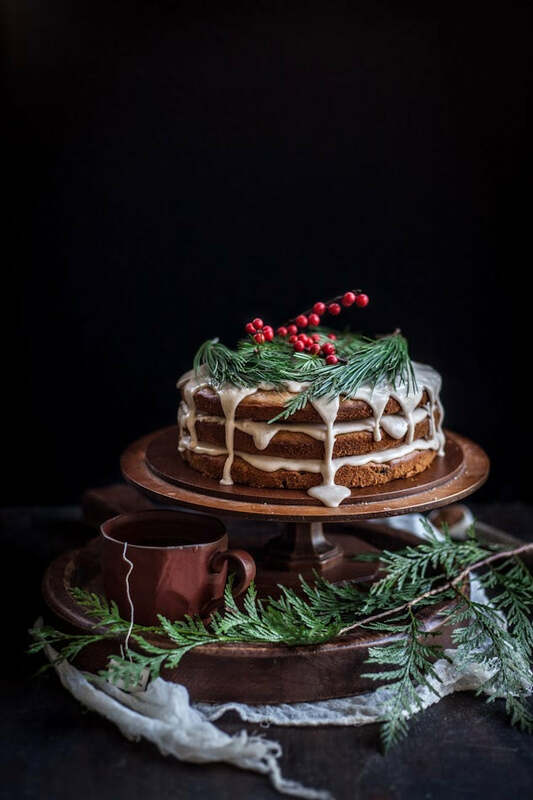 Get really sophisticated with this holiday cake. Without the garnish, it would be beautiful, but the red and green of the berries and pine take it to the next level. Who knows? Santa Claus might even be jealous he didn't get this instead of sugar cookies and carrots! Make a dessert for every one of your guests that's merry and bright. 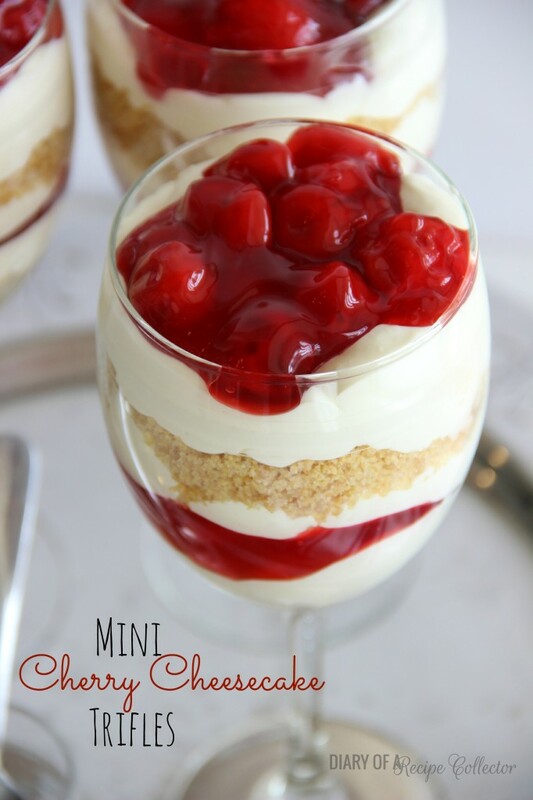 These cherry cheesecake trifles look beautiful with their layers of sweetness and creaminess. Plus, their red color makes them perfect for the season. We think they could become even more amazing with a sprig of rosemary or pine as a garnish.